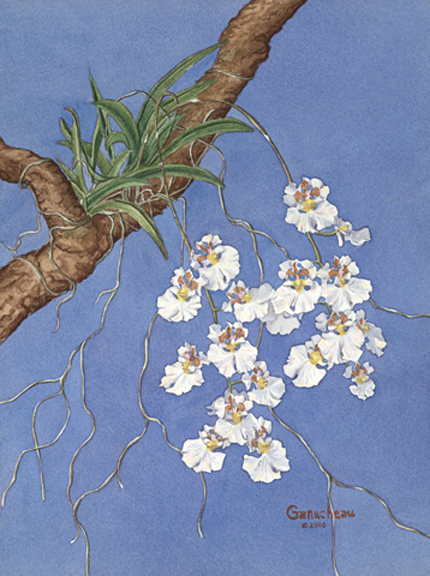 Original watercolor painting of the equitant oncidium orchid hybrid cross Native Dancer by Rose Ganucheau. This was a wonderful flowering of a beautiful equitant oncidium cross, Native Dancer, that we got from Anita Aldrich. The pure white flowers dance in the breeze on a cobalt blue sky. 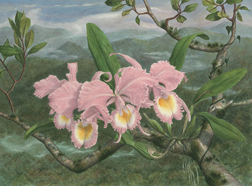 The frilly dress-like labellum adds to the illusion of twirling dancers. Now available as a Full-Size Limited-Edition Giclee' Print. Price $70.00, plus shipping. Edition Size 100 prints.